Showing results for tags 'teaching textbooks'. OK, so this is our fifth year homeschooling. I really thought by now I'd sort of have this all figured out. The last 4 years I used Life of Fred for math for both boys. It was great up until last spring when nothing seemed to work. We tried out Teaching Textbooks 3.0 in August and TT got 3 thumbs up - both boys and I liked what we saw. So we are about 4 weeks in TT. My 14 yo is using the Algebra I and my 11 yo is using Pre Algebra. I am literally losing hair, sleep and of course my sanity over the fact that they both refuse to write out their work on paper. They insist on doing it in their heads. I'd be sort of ok with this if they got the work done CORRECTLY. However, they are not. Of course, I can't see where they made a mistake in a problem as it is in that thick skull of theirs. I knew this would be a risk using an online program as they much prefer just typing an answer in the box and moving on. However, I'm a firm believer in you need to write this stuff out...when it's there line by line, if a mistake is made you can catch it and work on why the mistake was made. I know I'm preaching to the choir here but I just want to lay out my math beliefs ? I've made them redo entire lessons when they've not written out the problems....doesn't seem to bother them. Where have I gone wrong? When we did LoF, I made them write everything out so this is certainly nothing new. Granted there is more work now as TT is on average 20 problems where LoF was never that many unless it was a bridge (a bridge is a test for those of you unfamiliar with Fred). How can I make them realize they need to write this stuff out? My 14 yo is taking a physics class at our co-op this year. There is more math in it than anticipated but he is doing well with it. Except for the fact that he isn't showing his work! His teacher said the same thing I have said to him. All I get from him is the "I know, I know". I will say this week he has been a little better at it but the 11 yo has me literally at my wit's end. The 11 yo has never wanted to write out his math. Ever. It's been a struggle for a while now but I seem to have come to my breaking point. I just went over today's work and lost it on both of them. The 14 yo's main offense was he didn't date the paper or write down which lesson it was - I know not the biggest deal but I had just finished looking at the 11 yo work that didn't have much work to look it. Or if he did write it out, he just stopped when he got the general idea of what the answer would be (ex. if the answer was 23.45...he stopped at 23.4) I don't think this is a dysgraphia issue. Both will write for history, Latin and English. Many thanks in advance for any advice you all may have. I hope I'm not the only one with obstinate boys. 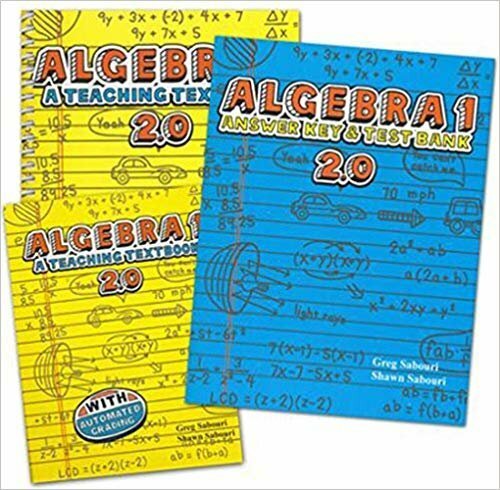 Seeking honest opinions on Teaching Textbooks for Algebra I, help! Yes, I've read the pinned post on math programs and did a search for TT and Algebra. What I need is some honest feedback at this point. Our DS is interested in science and technology, and always did well in math. Until algebra, where he's encountered some difficulty. We're currently using Holt through publisher with online materials. However, even with some repetition he's continuing to have difficulty with some of the concepts. I'm wondering if something more straightforward would help. I'm drawn to Teaching Textbooks because of the online gradebook and constant feedback. Questions: Would TT Algebra be a solid course? He did the placement tests but I'd not be comfortable in placing him into Algebra 2 at this point. (I'd thought TT was a year behind, but not sure about higher grades). He's currently between 1/2-2/3 done with Algebra in terms of going through book, but I don't think his skill level reflects this. I'm thinking about starting him at beginning and testing through the TT Algebra I until he has difficulty, and then starting lessons at that point. Is this a good approach? Any other feedback on TT Algebra, good or bad? This is a very intelligent kid but he does have some difficulty focusing. We'd always thought he was geared to go the math/science route but we're off to a later start and he really is showing more strengths at this age in some other areas. I just wanted to share that this year we're using Teaching Textbooks 5 for my daughter's fifth grade math curriculum. (Last year we used Oak Meadow's built in 4th grade math curriculum; prior to that she was in public school). We just got this year's standardized test scores back, and I wanted to share the math portion of her results. We used the CAT/5 from Thurber's Educational Assessments. With the Stanine Scores,the highest you can get is a 9. The "National Percentile" number means she scored as well as or better than that percentage of students nationwide who took this test. Results: Math Computation - Stanine 6; National Percentile 77. Math Concepts & Application - Stanine 7; National Percentile 81. Total Mathematics - Stanine 7; National Percentile 82. For comparison, this is a child who I do not consider particularly "mathy" and who had been starting to develop a "math is hard, I'm not good at math" attitude by the time I started homeschooling her toward the very end of third grade. In fourth grade, we used Oak Meadow's built in math curriculum and she'd taken the CAT-E from Seton just for the heck of it last year, even though we didn't have to do standardized testing that year. Last year, her math scores were: Math Computation: Percentile, 58; Stanine 5. Concept & Application: Percentile 59; Stanine 5. Mathematics Total: Percentile 59; Stanine 5. I had been happy with that. She was a bit above average, scoring right where she "should" for her age and grade level, and I thought that was great considering she wasn't "mathy," and I was a pretty relaxed homeschooler. This year we started Teaching Textbooks because in the older, used version of Oak Meadow I have, they only had their own built in math curriculum up until fourth grade. Once 5th grade came along, they recommended Saxon. I knew Saxon was not for us and that it would make us miserable (I'm not "mathy" either), and after a lot of reading up on it, I decided on Teaching Textbooks. AND I decided to keep her at her grade level, not try to get a higher grade level just because TT was said to be "behind," because I wanted her to get it, not struggle with it. I know a lot of people here worry that TT is "below grade level" or "not good enough" or what have you- but we LOVE Teaching Textbooks over here, and here's why: 1. My daughter is ENJOYING Teaching Textbooks 2. She is UNDERSTANDING Teaching Textbooks 3. She is GAINING CONFIDENCE from Teaching Textbooks and no longer says anything like "I'm not good at math" or "math is too hard" (although once in a blue moon she does still say "math gives me a headache" haha). 4. She can do it pretty independently 5. It's not overly time-consuming (about 30 minutes per lesson, 4-5X a week) And now, I can add 6.- Her math scores (as per the standardized test results, even though we used a different version of the test this year) have improved over last year, and are in my opinion very good, especially for a non-mathy kid using a math curriculum many people put down as not being advanced enough. Am I saying she's suddenly a math genius? No. But a non-mathy kid using Teaching Textbooks (no supplementing with anything else) took a standardized test and overall did as well as or better than 82% of the rest of the students who took this test nationwide and to me, that's huge. I do believe it goes to show that you CAN use Teaching Textbooks without worrying that you're burying your kid light years behind all the other kids- that's just not true. Anyway, I just wanted to share in case this helped anybody make a decision about TT. :) If you want more info about TT and care to take a peek at my review of it, you can see it here: http://nancextoo.livejournal.com/124221.html And if you are curious to see the rest of our standardized test score results from 4th and 5th grades, you can see them here: http://nancextoo.livejournal.com/172564.html P.S. If anyone else wants to share how their standardized tests went after using Teaching Textbooks, feel free to do so in this thread if you'd like! Talk to me about TT & Tablet Class Geometry! Wandering the Math Maze-- NEED HELP! â€‹My 11 year old son, who is finishing 5th grade, has not had a great Math experience in life. His sister has done well using MUS from the very beginning. But when I did it with him, he just looked at me perplexed over and over again for months. He just didn't get it in kindergarten, we tried again in First grade and got through most of Alpha. But then he hit another road block. I took him out and did general things--teaching the clock, money, basic geometry, using the Math Mammoth Blue series topics. But there was too much on a page and it overwhelmed him. I tried to go back to MUS but the same thing happened. So in 3rd grade I moved him to CLE Math, but he placed in 2nd grade. He did really well, except he couldn't seem to get caught up. The volume of work for one lesson was all he could do in a day and he was behind a whole grade. Then before too long, in 4th grade (doing 3rd grade work), the volume of work completely overwhelmed him. We skipped problems, he'd fail the test. We'd give him longer to do the lesson, breaking it up into a couple days, and he'd get totally lost in what he was doing. We skipped problems (do the odds) and do it in one day. That's when the ADD symptoms seemed to really kick in. I believe in not moving on until he gets it but it was taking forever and the tears were becoming a constant, daily occurrence. We weren't making any progress. So last year, the beginning of his fifth grade year, we switched to Teaching Textbooks. He placed halfway into their 4th grade year and about three weeks ago he finished it. He still doesn't have his multiplication tables memorized, even though we reviewed them daily. We would play games online, he has one of those handheld machines. FLASHCARDS! We have our standardized testing next week and I've been doing some reviews with him, and he had no idea how to carry in a multiplication problem. What is going on? Is it Teaching Textbooks? Is he just not able to pay attention to it, like it's not sinking in? He finished every problem and gets a 100% on it. But he isn't retaining anything? Or is it him? He's been tested ADD and the psychologist didn't recommend medication because his is so slight. He didn't qualify for any services in the school system because it's not that bad, they said. He tested off the charts in visual/spatial, they recommended we point him toward engineering. How do I do that if he can't do math! To add to the conundrum, we live overseas. So the only resources we have are what we bring down with us or I can download from the internet. I have the next TT5 set. I have the complete Math Mammoth set. I have all the DVD's from MUS through Algebra. I'm willing to sit down with him and help him through it, to make sure he's getting it. Was I too lax and assumed that he was understanding it all because he completed the assignments and got good grades? I'm scared to see what the SAT is going to tell me. I do have a 4 yr. and a 1 yr. and perhaps I was too distracted to notice? I feel like perhaps I need to find out where he really is comprehension-wise and go back to that with some curriculum and plod along with him until he gets it. Any recommendations? (How do I do that?) Any advice on what resources to use and how you would do it? We are going to the States for the month of September for my parents' 50th, so we can buy something that I don't have if necessary. I'm willing to work hard with him. (By the way, I'm not the math whiz in our family, my husband can help a bit, but he's super busy. School is my thing.) Thanks in advance. We have been using TT3 this year with my 3rd grade daughter (this was our first year at home) and she's not super excited about it. I thought it would be a great fit bc it's on the computer and I loved it bc it was hands off for me. I will say that I'm not super impressed with the rigor of it and it hasn't gone as deeply into some subjects as I wish it would have (fractions for example) so we've been supplementing a little bit with just a workbook. I'm trying to decide what to do for 4th grade - do we continue with TT4 or change to something else? I've been looking into Beast Academy bc she loves graphic novels - but I'm not sure where to start with it bc it seems much more rigorous than what we've done this year with TT3. I'm curious how people feel about it and if it can be a stand alone or if I would need to find something else to use with it? I've thought about switching to Right Start, but I'm worried that the financial investment for starting it in 4th grade wouldn't be worth it. And honestly I'm not sure that I'm up for the intensity of that program. My 7th grade son struggles with math. We are using TT for the first time this year. He tested into the grade 7 book, but I feel like he's not doing well. I don't like the second chances the program gives. He's dyslexic and has focus issues anyway, so I feel like having a second try at each problem gives him liberty to not pay close attention to his work. For that reason, I have a rule that if he has to redo three or more problems or gets three or more wrong in a lesson, he has to redo the lesson again the next day. Am I being unreasonable? He's only on lesson 17 so far and he's had to do the past four lessons a second time. Some of the errors are silly, not paying attention mistakes and some are forgetting how to work the problem. For example, today he forgot how to do long division. He's a kid who needs lots of repetition in a given concept, but also lots of review so he doesn't forget. Is TT not the right math program for him? It took him two hours to do his lesson today. He missed two practice problems and had to redo three of the lesson problems, still getting one of them wrong on the second try. I have Saxon, but feel like it would be too wordy for him due to his dyslexia. I could teach him the lesson, but he prefers to do most of his work independently. Any advice? TIA!